Planning a Disney vacation can be very overwhelming, especially considering where to stay in Orlando with so many options for all budgets and accommodation preferences. 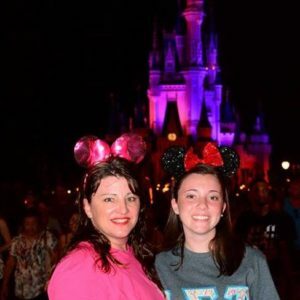 The first step in deciding where to stay should always be asking, “Do we stay on site at a Disney Resort or do we stay off site?” There are pros and cons staying off site at Disney World, while being in the middle of the magic at Disney World is fabulous and convenient, it comes with a price. 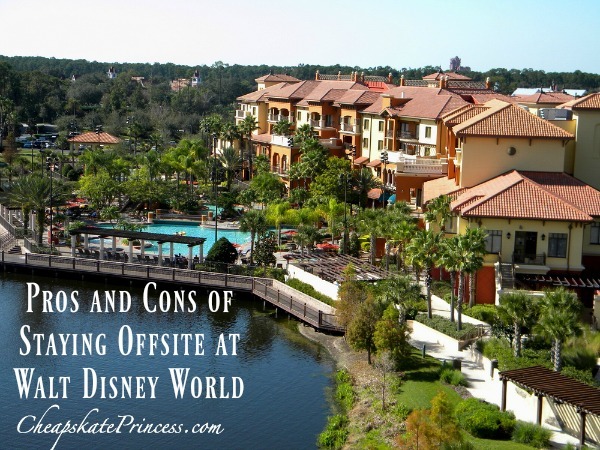 On the flip side, off site resorts not operated by Disney or located outside the Disney World property can truly make a Disney vacation thrifty budget friendly, however sometimes offsite isn’t the best option. Don’t get me wrong, I love Disney Resorts, but sometimes our budget and needs lean towards staying offsite. Before even looking at specific resorts, we have a few things to think about in regards to your vacation needs. Read: To Get FREE Disney Emojis, Play Disney Emoji Blitz! Group Plans: Will your group want to always be together or have the flexibility to leave the parks separately? Transportation: Do you like having your own transportation? 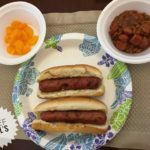 Dining: Do you want to be able to make our own meals on vacation in your resort room? 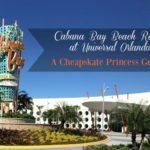 All Inclusive: Do you want to have a truly all inclusive vacation with meal plan at Walt Disney World? Accommodations: Do you want something other than a standard hotel room? Do you need more than one bathroom? Space: If you need more than one room are you okay with the possibility of not having connecting or adjoining rooms? As you answer the questions start to think about the pros and cons of offsite specific to your vacation needs. More Room: Staying off site will give you more space for your dollar. You can often find a 1 bedroom suite for less than a moderate resort room, sometimes for the same price as a value resort. You can also find the same quality and amenity room as Disney Moderate resort for the price of a Disney Value resort when looking offsite. 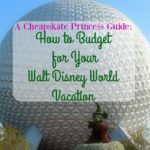 With lots of competition outside the Disney resort area, you can get more for your vacation dollar than at a Disney owned resort. Make sure you understand ALL the costs of an off site resort before you decide. Check for resort fees such as parking, WiFi, transportation to parks, and any fees above the nightly room rate. Less Expensive Suites: Do you want a separate bedroom for mom and dad, or you want your group to all stay together in a suite with more than one bedroom or bathroom? 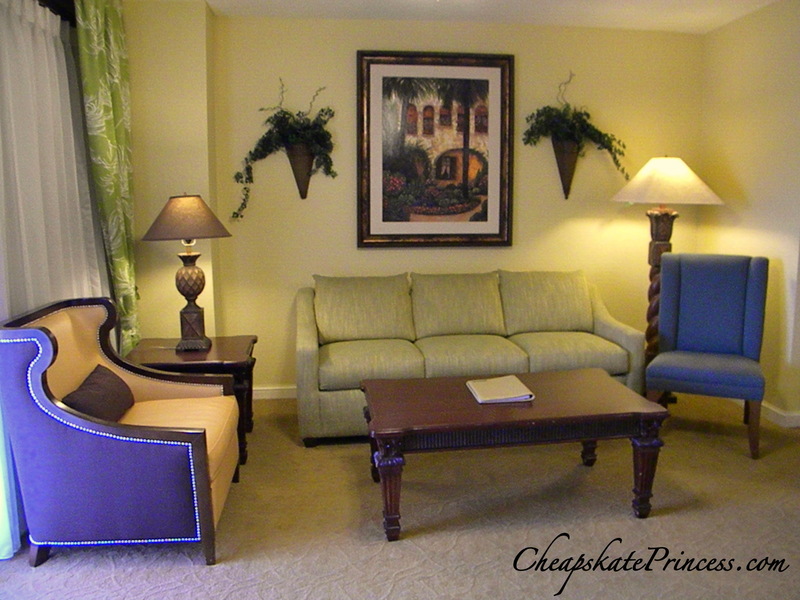 Disney Resorts certainly offer suites, but they come at a premium as they are typically in the Deluxe category which is not for everyone’s budget. There are suites at the value resorts, however being value category gives them fewer amenities. Sometimes it is cheaper to get 2 rooms at Disney versus a suite, however connecting or adjoining rooms are not guaranteed to everyone. Complimentary Breakfast & More: Some offsite hotels/resorts offer complimentary breakfast, which is a huge pro! Disney Resorts do not unless you have purchased Concierge or Club Level Rooms which comes at premium price and is only offered in the Deluxe resorts or Coronado Springs Resort. Some offsite also offer complimentary happy hours and dinners too. Kitchen: Do you want a full kitchen with dishes to cook some meals? Hey not everyone wants to cook, but some people like to during vacation and it certainly saves money versus eating out. 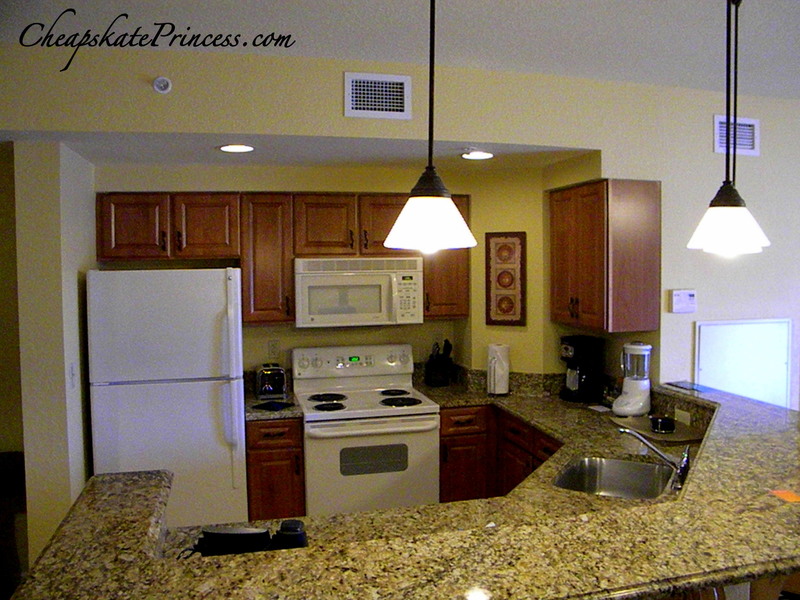 Offsite resort suites can offer full kitchens with dishes and all you need. Many suites also have washers and dryers in or off the kitchen. More Dining Options for Less Money: Do you want options for cheaper meals than what is found at the hotel? Off site hotels are closer to more options, including grocery stores. Being off site, you can be closer to a grocery store and easily pick up meals. A popular Orlando grocery store is Publix. You can make a quick stop for sub sandwiches or chicken dinner for under $25 for a family of 4. With full size refrigerators, leftovers are easy to store and save. Convenient to Orlando Attractions: Off site hotels are more convenient to other Orlando attractions and may offer transportation to attractions other than Disney (Universal, SeaWorld, etc). Disney Resorts only take guests to Disney Parks and Disney Springs. Last Minute Deals: Last minute options can be offered for off site resorts whereas Disney offers a promotion for a set time in advance. As the promotion ends, typically the only guests who can take advantage of any last minute promotions offered at Disney resorts are Florida residents or Annual Passholders. 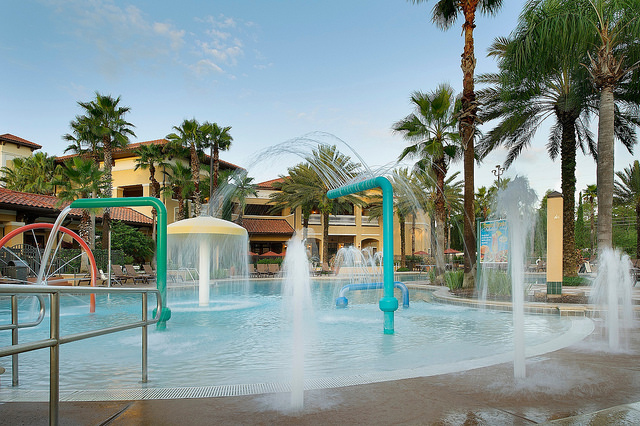 Extra Fun Resort Amenities: There are resorts of all budgets and amenities including free mini golf, children’s activities, onsite restaurants, near or on golf course, lazy rivers, multiple pools, children’s pool and splash areas, convenient to shopping and outlets. The list goes on but keep in mind it is different for every resort. To be competitive, some offer some fabulous amenities where you won’t want to leave and go to the parks, while others are a basic room and place to sleep. Pick Your Location: You can be as close or far away from the magic as you want. 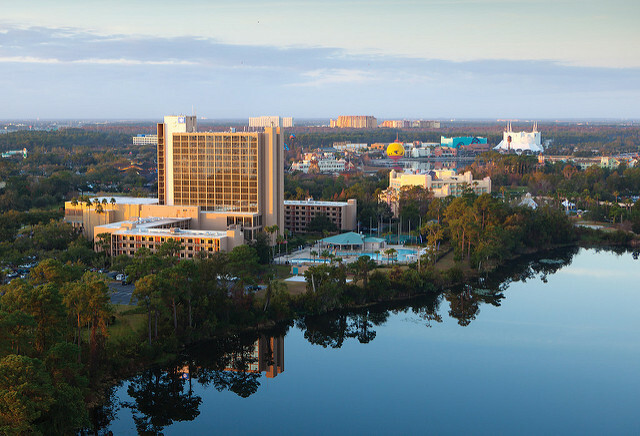 Resorts can vary in distance to the park with some off site resorts actually being on the Disney resort property (examples: Swan/Dolphin, Four Seasons, Wyndham Bonnett Creek, and the Disney Springs area resorts). Transportation: Disney Resorts offer convenience of being closer to the parks. From some resorts you can walk, monorail, or boat to the parks. Bus transportation if available at all resorts. Time is money when on vacation and not having to sit in freeway traffic can certainly add to relaxation levels. The buses for Disney resorts are right outside the gate and covered. For off site resort transportation, you will be out in a separate parking lot area with no shade. Magical Express: Where Disney Resort Guests get to use complimentary Magical Express Airport Transportation to and from MCO, many resorts do not offer this service so you will need to pay transportation to get to your resort if you have no car. Extra Magic Hours: Off site guests give up Extra Magic Hours only opening to Disney Resort guests. On select days, a park may have an extra hour in the morning before open to the general public, or an hour or more after the park closes. Resort Transportation: Disney Resorts off amazing resort transportation to other Disney Resorts, Theme Parks, and Disney Springs. Some off site resorts charge an extra fee for this service. Off site Transportation is typically less frequent than Disney Transportation which runs approximately every 15- 20 minutes. Check the schedule of the resort you are considering as some only offer hourly pickup or none in the middle of the day. When a meltdown happens – it’s hot and crowded, your only option to leave without a car would be a cab. Free Parking: Parking at Disney Theme Parks starts at $20 per day depending on your vehicle size for anyone who is not a Disney World Resort Guest. Factor that in your budget. If you drive to parks, it takes longer to get to the front gate once you leave your vehicle than if you are a Disney Resort Guest dropped off by resort transportation. For Magic Kingdom guests, this involves parking in lot, taking a tram or walking to the Ticket and Transportation Center, then taking Monorail or Boat to the front of the park. Disney Guests are dropped off by transportation at the front of the park via Disney Transportation. Extra Magic: As a non resort guest, you miss out on the extensive Disney Theming in the Disney resorts. From Disney Parks to resorts, you are in the Disney bubble. 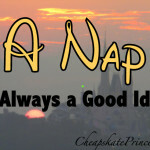 This might not be a bad thing if you think you need some downtime from the magic or are on Disney Sensory Overload. FastPass+: Disney Resort Guests can make FastPass+ reservations 30 days, before off site guests. 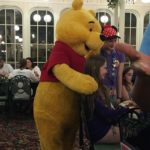 Disney Dining Plans: If you want an all inclusive vacation, you cannot get the Disney Dining Plans unless you are a Disney Resort guest. After considering pros and cons, think how you answered the questions. 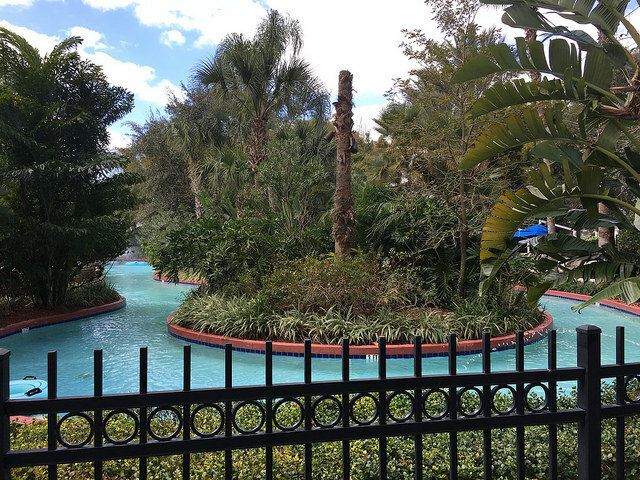 This will help you determine if staying at a Disney Resort or off site is the best for your next family vacation to Orlando. Would I say off site? YES I have several trips and would do it again and here’s why. 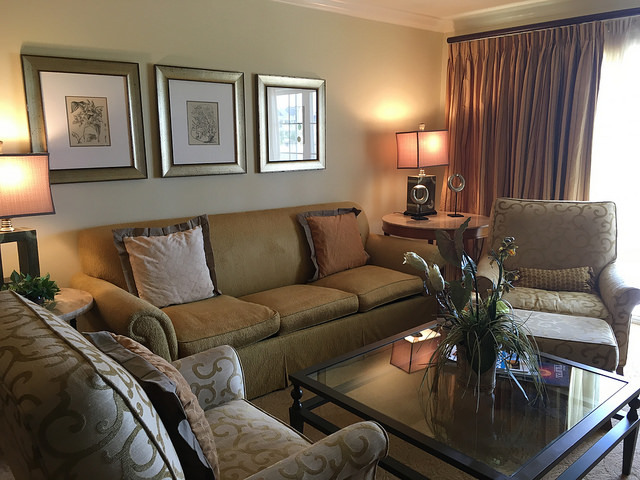 Our first family trip to Walt Disney World was with my mother in law off site and we relished in the 2 bedroom 2 bath suite as everyone had plenty of room. Having a bedroom door is fabulous when someone needs some alone time. For naps with a suite, you have a quiet space to close out noise and light. Having a kitchen makes it ideal to plan out simple breakfast, snacks and easy to make quick no mess meals of frozen pizza and quesadillas. Having a family sized table gives everyone space for meals and electronics. We also LOVE freezing our water bottles at night so we can enjoy icey water in the parks. Want to pack light? With washer and dryer in the suite, I don’t really mind doing laundry as needed. But I realize for some the idea of any meal prep and laundry on vacation is taboo. 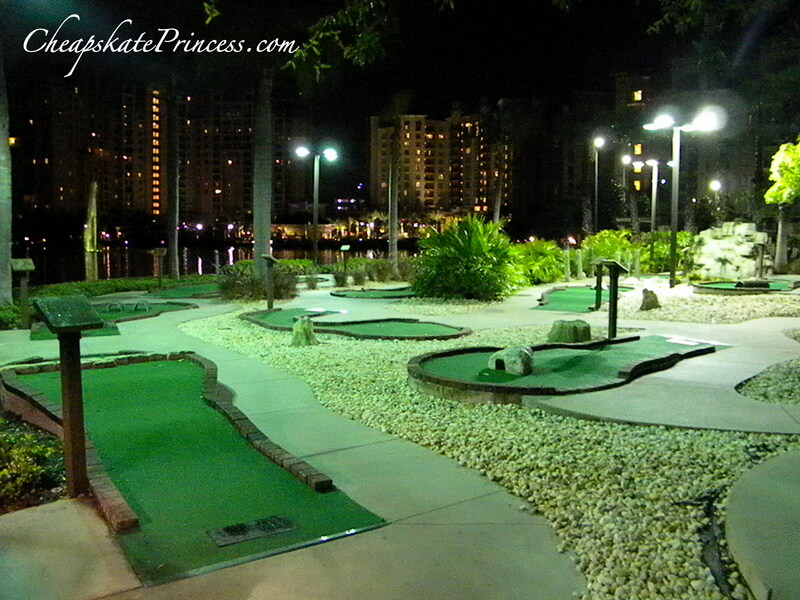 Off site resort amenities we have experienced can be on par with Disney Deluxe, for much less. One property, we had our choice of 7 pools and including two lazy rivers, water slides, a children’s splash area and plus free mini golf. Our daughter enjoys the kid activities offered at off site resorts just as much as ones at Disney. We have stayed in spacious hotel rooms where full cooked or continental breakfast is included, and even a free nightly happy hour offered. We probably most enjoy being able to spread out and just chill on real furniture in our down time. What we don’t like but found ways to make it work for us? Resort transportation from off site can be a total let down compared to Disney bus service. Our first trip we were literally running through Animal Kingdom to the parking lot to make the off site bus when my toddler was on a major meltdown mode. Had we missed the bus, it would have been another hour til next bus, with a hot, tired three year old. After that experience we drove to the parks and paid parking accepting there is a price for your control of transportation. Another minor issue, timeshare resorts can be annoying. Many timeshare resorts offer fabulous deals renting out suites to non members without requiring sales presentation. We won’t go to a sales presentation on vacation. We have unplugged the phone because of repeated calls to invite us to the breakfast presentation. Even when no presentation is required for a cheap rate, some can be very pushy on getting you to the breakfast presentation at check in and with those phone calls. Do your research on reviews, as many presentations last much longer than they tell you. With hours and hours of research time, I have prepared myself what to expect off site each resort we try out. What I wasn’t expecting was one trip where our GPS took us home from parks through an unmanned change only toll both. We had no change and didn’t know unmanned exact change only booths existed. We got a ticket in the mail after returning home for not paying the toll. Thanks State of Florida, live and learn, we always have a roll of quarters with us now. You can also have everything planned and bam, traffic jam on the highway affecting your park arrival time. 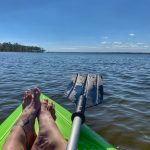 Despite these issues, we always consider off site when planning a vacation, even though our family of 3 can comfortably fit in all the Disney resorts. Sometimes the rates are just too good to pass up and have enticed us to visit Orlando when we weren’t planning on going. You can be as close to the magic or as removed as you like when off site, just make sure you understand the terms or your vacation resort AND all the costs associated with your stay.